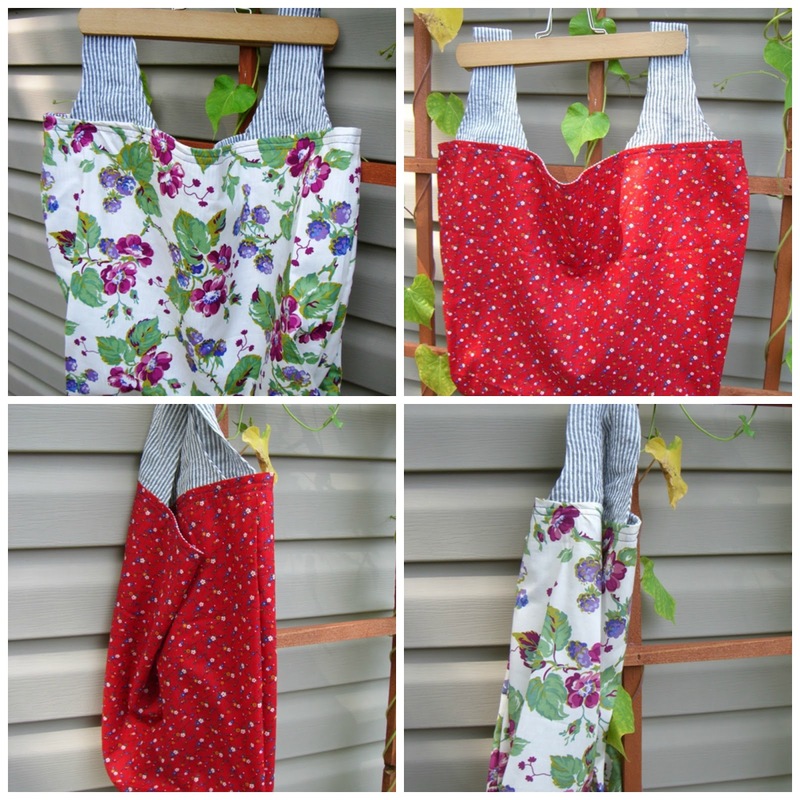 So remember the ugly See and Sew B5413 grocery bag? I had mentioned in that post that I had a different pattern that I liked a whole lot better. 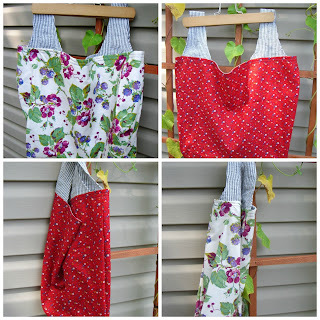 It's the grocery bag pattern from Michelle's Patterns (affiliate link). I have made a ton of these and use them for all my trips to Walmart or the grocery store. I like the pattern because it's not bulky. There's no bias tape, no interfacing, it's just two layers of fabric. Sturdy enough to hold your groceries without adding unnecessary heft to your load. The handles are great too, because they're strong, and they don't cut into your palms the way plastic handles can. Plus they go together pretty fast and are a good project for beginners. I made two bags. The cream with a floral pattern is some stuff that's been in my stash for almost a year and is from Benatrex, called "Magic Vine". It features purple flowers and blue berries. I got it at a little fabric shop out in the country. Seriously, it's on a gravel road, kind of in the middle of no where. The red fabric my mom got from her aunt- so my great aunt, who quit sewing. It's a vintage V.I.P. piece and features a cute little floral pattern. I think the red one is my favorite. Just because it's probably more my style. Secondly, I was going through my Bloglovin feed Monday night and found this sew-a-long that See Kate Sew posted from earlier in the day. 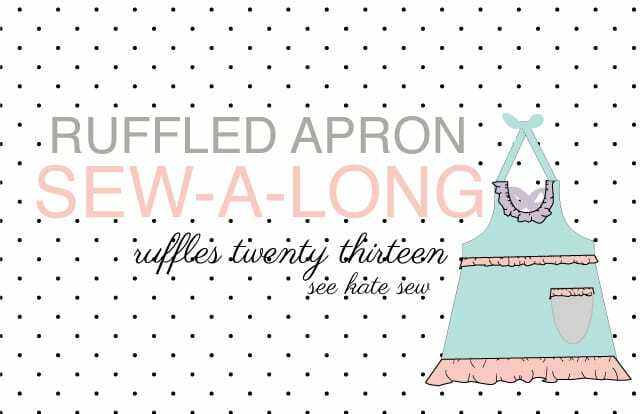 You can join, and try this super cute apron pattern for free. The apron only takes a yard of fabric for the base, 1/2 yard for lining, and 1/3 yard for accents. 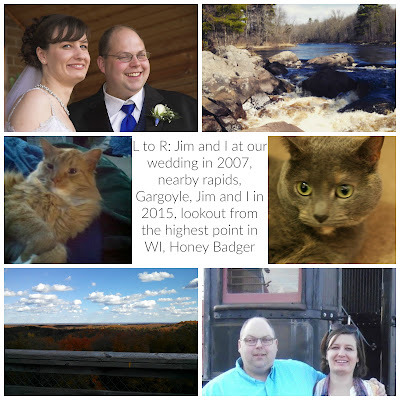 If you're interested, click the picture and it will take you to all the particulars. I signed up, so let me know if you decide to as well so I can keep an eye out for your finished project.